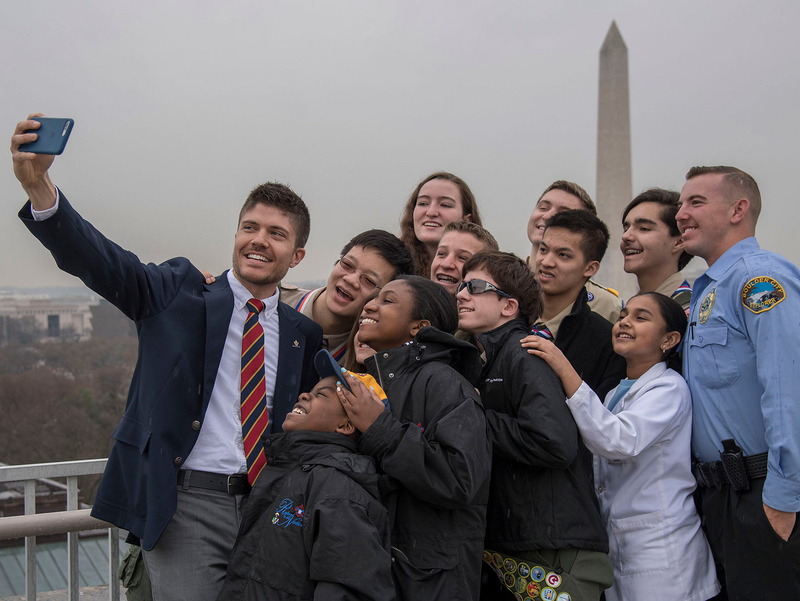 It’s a season of firsts for the Boy Scouts of America, and these history-making moments aren’t limited to the Feb. 1 launch of Scouts BSA. Earlier this month, a group of 18 Venturers from the Kansas City, Mo., area became some of the first young women ever inducted into the Order of the Arrow, Scouting’s honor society. The history-making event required careful planning by the Tamegonit Lodge’s youth leadership and support from lodge adults. As I reported in May 2018, the National Order of the Arrow Committee approved a plan to open unit elections to Scouts BSA troops, Venturing crews and Sea Scout ships. Previously, elections only were for Boy Scout troops. The Order of the Arrow, or OA, has welcomed adult women since 1988. The updated election policy, which became effective on Feb. 1, 2019, means women and girls who are under 21 are now eligible for the service-minded society. The story of how members of the Tamegonit Lodge sprang into action is one of inclusivity, kindness and cheerful service toward others. Blake Steinmetz didn’t procrastinate. He started planning the ordeal weekend back in May — the same day he learned about the OA’s move to welcome young women into its honor society. He wanted to become one of the first lodges in the nation to induct female members. Steinmetz, then serving as lodge chief for the Tamegonit Lodge, shared the idea with his vice chief of inductions, Brian Blood. Blood, now the Tamegonit lodge chief, loved the idea. Because Scouts BSA members who are new to the BSA couldn’t have met those requirements on Feb. 1 (Scouts BSA launch day), Steinmetz and Blood knew they’d be looking for eligible Venturers or Sea Scouts. Their next step was to contact the council’s Venturing Officers Association to gauge their interest. With the Venturers’ support, Steinmetz, Blood and their fellow lodge officers began to plan the ordeal weekend. Tamegonit Lodge Chief Brian Blood (left) explains the Order of the Arrow to new members of Scouts BSA. The Scouts BSA members will be eligible for election once they have camped for 15 nights and earned First Class. All that planning paid off on Friday, Feb. 1. That night, Venturing crews and Scouts BSA troops from across the Heart of America Council packed into the dining hall at Theodore Naish Scout Reservation — about 20 miles west of Kansas City. Blood and his fellow OA members explained how OA elections operate and then began conducting elections for each crew in attendance. After the ballots were collected and tabulated, the Tamegonit Lodge ceremony team hosted a call-out. The call-out is an unforgettable moment for any OA member. It’s the first time you learn you’ve been elected into the OA and the first step to becoming a member of the honor society. In all, 28 members were called out: four Scouts BSA boys, two Scouts BSA adults, four Venturing adults, and 18 youth female Venturers. The Ordeal candidates complete a service project at Naish: repairing and painting staff cabins. The OA Ordeal challenges a candidate physically, spiritually and mentally. Candidates are called to cheerful service and complete the Ordeal with a rejuvenated spirit. When the Ordeal is complete, candidates are officially inducted into the OA. They’re deemed ready to live the OA’s values of unselfishly serving their community, family and Scouting. As the Ordeal candidates headed out to their work crews on Saturday, the maintenance staff at Naish noticed the candidates’ positive demeanor. That night, with their tasks completed, the 28 candidates participated in the Ordeal ceremony. By 8 p.m., the 28 — including the 18 young women — received their crisp white OA sashes. Smiling with pride, the new OA members posed for pictures and talked with Blood and others about their experience. “I remember my brother joining, and I am so happy to be a part of this family,” one young woman told Blood. “I feel honored that I was able to join. It feels special,” another told him. What was true earlier this month in Kansas City is true all over the country: the spirit of the Order of the Arrow is alive and well. And that light will only continue to shine brighter. Read more about the OA’s membership requirements.